Back in the summer, I stumbled across a full black bin bag of leather offcuts at a local car boot sale. These are hidden away in a blanket box in the lounge, it’s time to have a play to create a DIY leather plant pot holder. I love indoor plants, now the children have moved beyond the toddler stage I am enjoying reintroducing plants into our home, admittedly I do pick hard to kill plants! Plant pots can add up in cost – these leather plant pot holders are wrapped around the plastic pot the plant comes in (with a drip tray on the base). 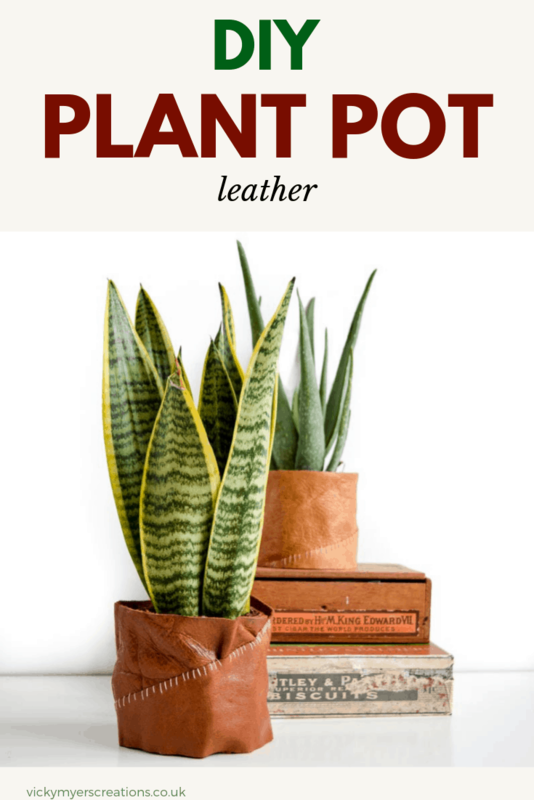 Create these leather plant pot holders to take an everyday plant to the next level, they make a great gift for any adult. Measure the circumference and the height of your pot. Mark out your leather, as per the diagram below. You are creating a rectangle which is the height and length, mine is 14 3/4” by 4 1/4”, following straight on a triangle, the same length. Wrap the leather around the pot so you can see that a gather will need to be made along the bottom of the full width leather piece. Using small running stitches with a strong thread gather in along the base of the rectangle. Wrap the leather around the pot using E6000 glue along the base to hold the triangle leather in place, hold with either clover clips or paper clips whilst it dries. Once dry remove the pot. Using a strong contrasting thread with a leather needle stitch vertical stitches along the edge of the triangle to secure it in place and add emphasis to the line. If your pot narrows as it goes towards the base you may get a little crumpled look, personally, this adds to the charm. Once your stitching is complete reinsert your plant. If you love leather pots and would like to add a hanging leather plant pot to your collection, or to make as a gift check out Dream a LIttle Biggers gorgeous hanging leather pot. I just found you and subscribed! To say I love these leather pot covers is an understatement. The tutorial is thorough and easy to understand. Thank you! I off to shop leather scraps.